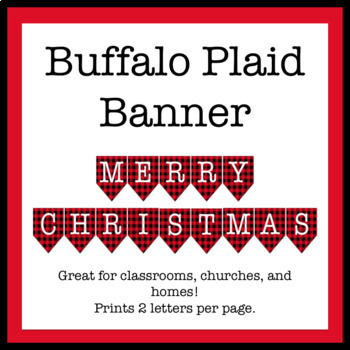 This file includes a Merry Christmas Sign in Buffalo Plaid. All rights reserved by author. This product is to be used by the original downloader only. Copying for more than one teacher, classroom, department, school or school system is prohibited. This product may not be distributed digitally for public view. Violations are subject to the penalties of the Digital Millennium Copyright Act. Clipart and elements found in this PDF are copyrighted and cannot be extracted and used outside of this file without permission or license. Intended for classroom and personal use ONLY. See product file for clipart and font credits. Please contact me if you wish to be granted special permissions.